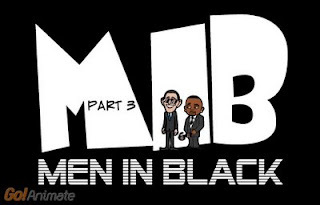 My Men In Black parody series is a classic example of my script writing style. Way back in December of 2008, when I started the series on GoAnimate with Episode 1, I could never have imagined where this story would go. By Episode 2, Paul Dini's Little Rashy had become central to the plot as I started referencing two of my other animations (The Boss of Everything and The Copier - Part 2) that feature Rashy on his quest to be the boss of everything. The key to my writing style is that I don't plan stories from start to finish. I just start them and see where the story and characters take me. By doing this I'm never daunted by the enormity of the script or how much work it might be to animate. At the same time I'm always thinking about what has happened previously in the story and seeing if I can relate the current story back to some of those references. As you can see in this episode the joke from episode 2 about the boss of MIB being a Sock Monkey is expanded upon greatly here. When I wrote the original joke it was just a throw away line but, because I rarely plan ahead, I've been able to bring it in as a central plot point and even use it to create a rift between Agent A and the President. Two things that were never in my mind when I completed episode 2. If you've followed this series you may remember back in episode 1 that Agent 'Roy' had a special controller that caused the President's MIB Glasses to view anyone as an alien. The Observant amongst you might notice in this Episode that Rashy is holding a similar controller... could be a clue to what happens next? Finally, if you're wondering, the opening scene showing MIB's Main Headquarters, docking port is entirely a custom made background that I drew in under an hour directly in ink (i.e. no pencil lines or sketching). It wasn't created for this series at all but is simply an elaborate 'doodle' I did one day just to get me drawing. I originally used it as a background for some other characters that you can watch me draw in this two, three minute challenges video below (watch for the background at the end). However I've been wanting to do a lot more custom stuff with GoAnimate and this background seemed perfect for the MIB series. Excellent exercise. It may have looked simplistic to ordinary people, but to do that in a few minutes with an ink pen. That was pretty incredible. This is great! Thanks for pointing me here. Thanks for the comments Brian and Coady. Domo Fishing and Farting - oh my!